On Friday [So Be It], I said I was starting to get a handle on the screaming monkeys in my head. Here’s my current thinking. Normally, waiting to get back on after a fall makes the situation worse. However, on that day, I was an emotion wreck before I got anywhere near Milton. As a result, my head is not really any more screwed up. I realize that it – whatever “it” is – has to come from inside a person. In the movie Mr. 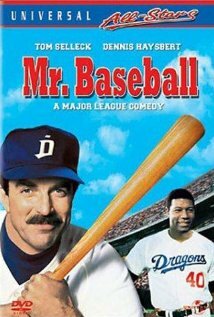 Baseball, Tom Selleck plays a burned-out player traded to Japan. A Japanese coach has him hitting peas and golfballs and whatever. Finally Selleck says, Dammit, I want to hit a baseball. Ahhhhh. I see now that I need to get to the place where I want to hit the baseball. I have let self-doubt erode my initiative. The lesson horses have been a enormous boon. However, they can take me only so far. I want to be more than a passenger on other people’s horses. I have be able to say – with conviction – Dammit, give me those reins. I am of the opinion that my mental state was not contributory to the explosion. My witness agrees. Who knows. Without access to the instant replay, we may never determine what the hell happened. Conversely, if Milton had been a foot-perfect angel, I would still need to get my head back in the game. In essence this is the same message as Friday, just through a positive filter instead of a negative one. Time will tell if it is a productive line of reasoning or more mental wheel spinning. Good thinking. I’m delighted to see your turn-around. Milton will notice it too.